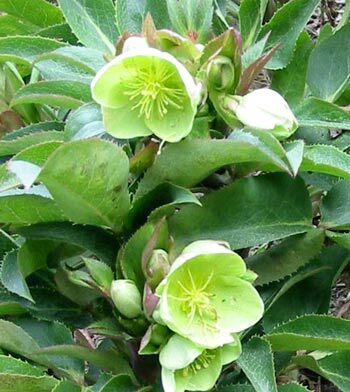 My perennial book calls Hellebores 'useful' winter flowering plants for cooler climates. The word 'useful' doesn't do these flowers justice at all! Lime green tinged flowers are subtle, even trendy, and I like to see this colour in my garden. In the Wattle Woods I grow several patches of the unfortunately named Stinking Hellebore. I can't smell anything, and I really enjoy its long thin leaves and lime green flower colour. The Stinking Hellebore self seeds without becoming a nuisance, occasionally protesting when the garden gets too dry. I love its ferny foliage. My attempts at photographing these lovely winter roses have been rather amusing, though. Of course the flowers of Helleborus orientalis (most common in my garden) bow their heads shyly earthwards, and I have to do elegant arabesques to get the desired visual result. I've read about plant breeders who are forever trying to create the deepest, brightest, bloodiest red-flowering Hellebore. I am often tempted to buy in such plants - money, money, money! And of course the double flowering varieties could be very tempting. At the moment I only have one subtle red clump, which is more the colour of a faded satin red dress. It took several wobbly one-legged poses and a nose dive into the winter-wet dirt to get the photograph opposite, but you'll easily see why Hellebores are sometimes called Winter Roses. Finally, my perennial book (see, I am trying to be a more intelligent and informed gardener) tells me that all Hellebores are poisonous. Eeek! This seems a pity, as it could stop some gardeners from growing them. 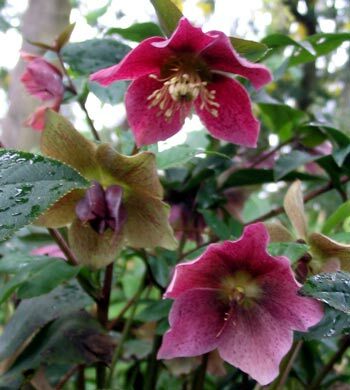 After all, they are frost hardy and happy in tree shade - perfect behaviour required for a winter country garden.